If you're in the mood for a hearty stew but want something a little different from the traditional kind you make, why not try this crock-pot lamb daube? 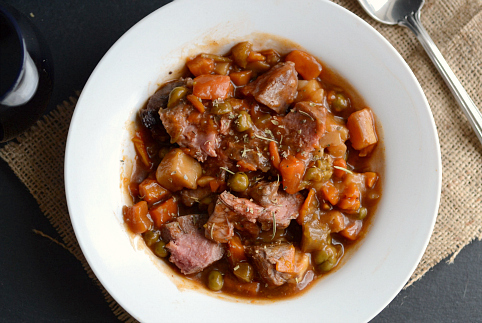 Daube is simply a classic Provencal French stew made with beef (or lamb), red wine and hearty root vegetables. What distinguishes this from a regular stew is that it doesn't have a lot of broth, since it's often served like a stroganoff, over noodles or rice. This daube is the perfect winter night dish since it's hearty, comforting and can be made in a crock-pot! We know how hard it is to motivate yourself to cook when it's pitch black out by 5 p.m., so this stew is the perfect remedy. Place the ingredients in your slow cooker before you leave for work and let them cook until perfection. By the time you get home, dinner will be ready! Liberally season the lamb with salt and pepper. Heat the olive oil in a Dutch oven over medium-high heat. Add 3 cloves of garlic and cook until just softening, about 2 minutes. Add the lamb shanks/shoulder and cook until browned on both sides. Remove from the pan. Add the wine to the pan and bring the mixture to a rapid boil, scraping the bits from the bottom of the pan. Add the remaining garlic, lamb, carrots, onion, potato, beef broth, rosemary, diced tomatoes, bay leaf and additional salt and pepper. Bring the mixture to a boil. Add the lamb to the basin of a crock-pot. Pour the vegetable mixture over it and stir to combine. Cover and cook on medium for about 5 hours. Serve over noodles and enjoy!